These India pictures showcase the country at its most diverse. From cities to villages, and mountains to desert plains, it's almost impossible to take a boring photo of India. Browse this gallery and enjoy a sweeping visual tour of India. The exquisite Golden Temple is a sacred Sikh shrine, made out of marble with a distinctive gold plated upper and dome. It's located in Amritsar, the spiritual capital of the Sikh religion in Punjab. 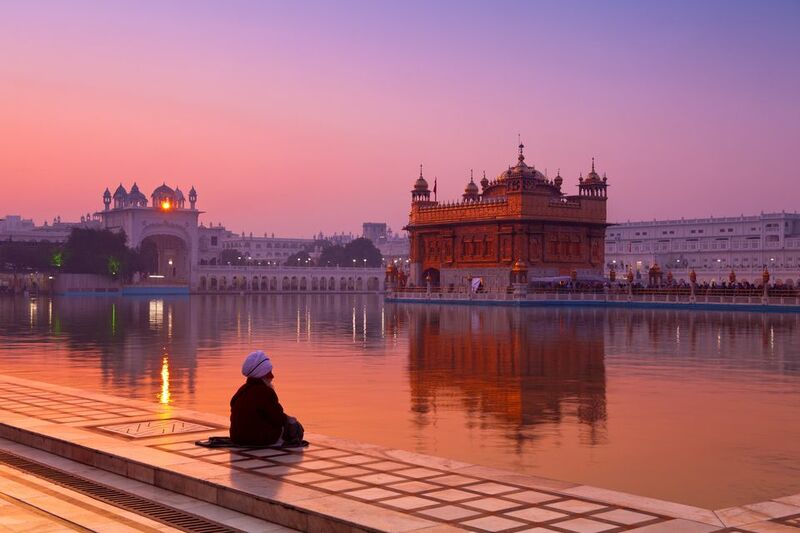 The number of people who visit the Golden Temple rivals the Taj Mahal. It's particularly magical at sunrise and sunset. In the furthest far flung corner of northern India, remote Ladakh has become a popular tourist destination for adventure enthusiasts. Leh is the common entry point to the region. Attractions in the vicinity include Buddhist monasteries and trekking. Kolkata, in West Bengal, is often referred to as India's cultural capital. Unfortunately, the city doesn't feature prominently on the tourist trail, despite the fact that it has some distinct attractions. One of them is the eye-catching wholesale flower market. These garland sellers can be found under the left side of the Howrah bridge, at Malik Ghat, as you approach it from Kolkata. The Great Rann of Kutch, India's surreal white salt desert, is an arid expanse that lies to the north of the Tropic of Cancer. It covers about 10,000 square kilometers and almost reaches Pakistan border. It's particularly eerie at sunset, and especially under the stars on a full moon night. Varanasi both attracts and repulses tourists at the same time. This sacred Hindu city in Uttar Pradesh has an ancient history and is one of India's top spiritual destinations. Known as the city of Lord Shiva, the god of creation and destruction, it’s believed that anyone who dies there will be liberated from the cycle of reincarnation. The fascinating thing about this mystical city is that its rituals are revealed openly to along the many riverside ghats, including the ritual burning of dead bodies. The south Indian state of Tamil Nadu is particularly well-known for its towering and intricate temples, which reflect the ancient Dravidian culture. The special feature at Ramanathaswamy Temple in Rameshwaram is the astonishing pillared hallway that lines its perimeter. Apparently, it's the longest of its kind in India. Photography is no longer permitted there though, due to security concerns. Meghalaya's most famous root bridge, the "double decker" root bridge, can be found near Cherrapunji (often referred to as the wettest place on earth) a couple of hours from Shillong. This 150 year old root bridge is not easily accessible. It requires a strenuous trek but it's worth it! Kuni Takahashi / Getty Images. The mesmerizing Kumbh Mela is the world's largest religious gathering, attended by millions of people each day. Sadhus of all sects converge to take a purifying dip in the holy water of the river, discuss their faith and disseminate information about their religion. A lesser-known but important part of India's history and architecture, the construction of step wells can be traced back mostly to between the 2nd and 4th centuries. The majority of the wells are located in the the hot, dry states of northern India -- particularly in Gujarat, Rajasthan, and Haryana. Many are sadly crumbling, although some have been well preserved and are worth exploring. Kerala is often called "God's Own Country". Its theyyam performances are "God's Own Dance". These distinctive and mysterious rituals represent mythological or ancestral spirits, with the masked performers believed to be possessed by the spirits. Most theyyam rituals take place in the Kannur district of northern Kerala, from October to May each year. The group of monuments at Pattadakal, near Badami and Aihole in Karnataka, is one of India's UNESCO world heritage sites that not a lot of tourists are familiar with. However, Pattadakal is believed to have once been the capital of the Chalukya empire, which ruled the region between the 4th to 8th centuries. The masterpiece Virupaksha Temple, dedicated to Lord Shiva, houses a massive statue of his nandi (bull). The Taj Mahal needs no introduction. It's undoubtedly India's most famous (and most photographed) monument. However, it's not often you see a spectacular ethereal image of it like this one! India has some imposing palaces that hark back to the days of royalty. Some have been turned into opulent palace hotels, as a way of maintaining them, while others have become monuments or museums (such as Udaipur's City Palace Museum). Many feature a sheesh mahal, a glittering hall of mirrors. This one is part of Amber Fort near Jaipur, where Rajput ruler Raja Man Singh lived in the 16th century. Kashmir is often likened to heaven on earth, and a sunrise on Srinagar's Dal or Nigeen lake certainly is scenic. Srinagar is known for its houseboats, and a stay on one is a must-do when visiting the city. The great Thar Desert is found in India's north western state of Rajashtan. It's a huge expanse covering 44.6 million hectares, and is believed to be between 4000 to 10,000 years old. A little over three quarters of it lies in India, while the remainder is in neighboring Pakistan. The Thar Desert is a fascinating place full of folklore and village life. One of the best ways of experiencing the desert is on camel safari from Jaisalmer or Bikaner. Mahabalipuram, not far from Chennai in south India, is a seaside town that's popular with backpackers and surfers. It's most well known for its windswept Shore Temple that's located right on the water's edge. However, it also has a thriving stone statue carving industry. Keep some money aside for shopping! Hampi is one of the top tourist destinations in Karnataka, as well as one of India's top historical places. It has some extremely captivating ruins, intriguingly intermingled with large boulders that rear up all over the landscape. The annual Ganesh festival is celebrated in an epic way in Mumbai -- it's the city's biggest street party! On the final day, towering idols of the beloved elephant god are taken for immersion in the sea. The procession of the biggest ones goes all through the night, and the crowds are phenomenal. Delightfully off-the-beaten-track, Odisha is an excellent place to become acquainted with India's tribes. Approximately a quarter of the state's population is tribal. Most live in the deep forests and hilly interiors of the southwest. Don't miss attending a tribal market! Did you know India has the world's only floating lake? Loktak Lake is situated near Manipur, in India's remote northeast region. It's renowned for its multitude of floating phumdis (swampy islands).